Following a successful run at the Abu Dhabi Film Festival and the Munich International Film Festival, Shawkat Amin Korki’s award-winning film MEMORIES ON STONE makes its UK premiere at the 2016 Manchester Film Festival. Written and directed by Shawkat Amin Korki, MEMORIES ON STONE tells the story of childhood friends Hussein and Alan who decide to decide to produce a film about the ‘Al Anfal’ Kurdish genocide following Saddam Hussein’s loss of power in Iraq. But as events conspire against the cast and crew, Hussein and Alan end up sacrifice everything, including their lives, to keep the film going. The difficulties start when their leading actress pulls out of the production. Desperate to find a replacement, a beautiful young woman named Sinur (played by the excellent Shima Molaei) comes to the rescue but complications arise when her uncle Hamid (Salah Sheikh Ahmadi) forbids her to take part in the film because she is unmarried. Sinur agrees to marry Hamid’s son Hiwa in order to star in the film but as financial, time and personal pressures begin to mount, it seems like the film is destined not to make it to the big screen. Dark, touching and ambitious, MEMORIES ON STONE is essentially a film-within-a-film. The dark tale touches on a difficult period in Kurdish history during 1986 and 1989 when thousands of men, women and children were executed during the ‘Al Anfal’ campaign under Saddam Hussein’s regime. Yet despite its sombre storyline, MEMORIES ON STONE is surprisingly funny, its absurdist humour bringing light to an otherwise solemn plot. Much of the comedy comes from the terrific Suat Usta who plays the flamboyant pop-star Roj Azad, whose presumed box office appeal far exceeds his acting talent. The extravagantly moustached actor is capable of putting Borat to shame with his over-the-top acting and terrible singing. Elsewhere, Nazmi Kirik puts in a strong performance as producer Alan, as does Hussein Hassan as the brooding director Hussein, who in a nice twist, makes his own sacrifice for the film. The true star of the film is Shima Molaei as the young, beautiful and passionate Sinur, although disappointingly, her character development weakens as the film develops. The discovery that her father was a prisoner in the jail they are filming is introduced in such a melodramatic way that is feels out of keeping with the rest of the film. The pacing is also a little slow at times, making the film feel longer than its 97 minute runtime. 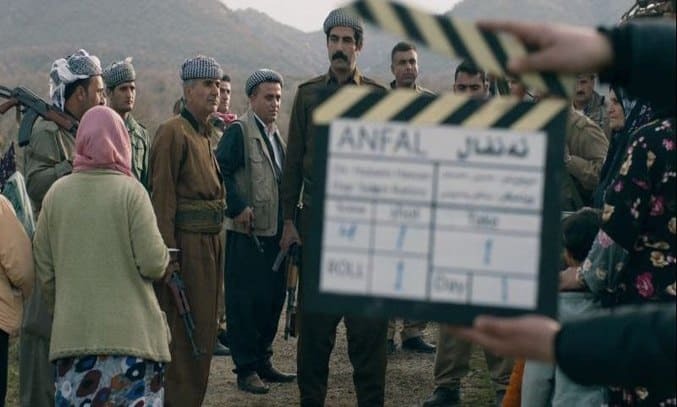 That said, Mehet Aktans and Amin Korki’s script works hard to contrast the Al Anfal tragedy with everyday absurdity and Salam Salavati’s camerawork captures the off-kilter feeling of the story. All in all, MEMORIES ON STONE is a touching and endearing piece of cinema about an inescapable past.